At Luxe Dental Clinic, designing smiles is based on many principles that are very important to create each ones individual unique and natural perfect smile. The Following are SOME of those principles. A smile line parallel to the horizontal is often thought to be most attractive. Even when the eye line does not coincide with this, the illusion of horizontal alignment should be created. Making your front teeth the same size and shape and positioning them around the center of your face produces the perfect looking smile. The smile line connects the biting edges of your top teeth. 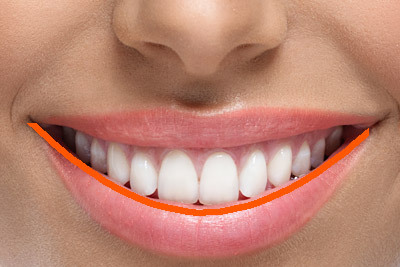 The most attractive smiles possess biting edges which gently follow the curve of the lower lip. 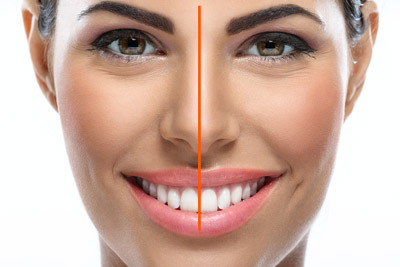 A flat smile line suggests aged worn teeth, while a curved smile line makes you and your smile look younger. The most attractive smiles possess gum lines which follow the upper lip and are symmetrical. The gum line is like a frame to a beautiful painting; it will significantly enhance the appearance of your smile, or significantly detract from your smile if poor in health and shape. The teeth towards the back of the mouth can always be seen in an attractive smile. 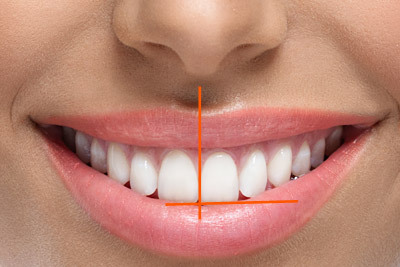 In a narrow smile the back teeth are often in shadow (this is called negative space), thus creating the appearance of black triangles at the corners of the mouth and front teeth that stand out.